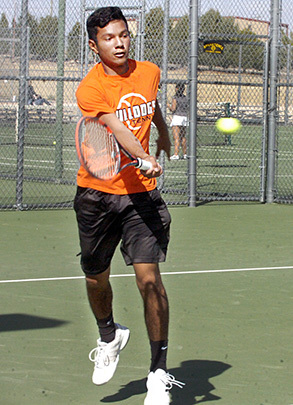 Graduation took its toll again on the Artesia High School tennis teams in 2017. The Bulldogs bid farewell to three members of their top four, while the Lady Bulldogs lost all four of their top players. When that happens, it’s a baptism by fire for both the athletes who previously competed in the lower half of the lineup – as they’re called on to step up against much stiffer competition – and those with little to no varsity experience who must come up to take their place. “That’s kind of the position we’ve been in the past couple of years,” Artesia head coach Tim Trentham said. “We’re young and we’re inexperienced, but we’ve got some good athleticism on both sides. All of that considered, the teams’ first four tournaments of the season were largely proving grounds. Competing against some solid competition, the ‘Dogs and Lady ‘Dogs used them to hone their skills and adjust to their new positions on the team, with some good results emerging as a bonus. At the Onate Invitational in Las Cruces, Valdez was able to take the consolation portion of the bracket. And at the Wildcat Playback in Lovington, the Artesia netters were able to get an early glimpse of District 4-AAAAA opponents Roswell and Lovington, splitting with the Coyotes and defeating the Wildcats. The Coyote Classic in Roswell March 2-3 provided a chance to compete against their third district opponent, Goddard, and saw the Bulldogs top the Rockets 5-4 and the Lady Bulldogs come up just short, 4-5. “That was a really, really tight one for the girls, and the match they lost was a split set,” Trentham said. Last weekend at the Claire Higgins Invitational in Carlsbad, the netters were able to cross swords with a variety of squads from Texas, another opportunity to grow and learn from quality competition. The Artesia teams hosted their home opener Tuesday at the Mack Chase Athletic Complex, a dual against NMMI. The perennially powerful Colts came out on top of both sides, defeating the ‘Dogs 0-9 and the Lady ‘Dogs 1-8. But the athletes in orange will be able to shake those losses off and continue their progression this weekend at the Cavern City Classic in Carlsbad. “This weekend is going to be another tough one,” said Trentham. “This tournament will have Carlsbad, Hobbs, Robertson, Lovington and St. Michael’s, and we’ll need to be ready to play. Trentham feels his teams have an excellent chance at sweeping D4 this season, considering the parity graduation losses at the other schools have left behind. Following their March 27 dual against Portales at The Mack, they’ll kick off D4 play April 3 with a home dual against Goddard. “I think this year is a good opportunity for both our boys and girls, because realistically, I don’t think anybody’s top dog, from what I’ve seen. Nobody is unbeatable. There’s no Goddards of the past that were just stacked up and down, no Roswell girls’ teams that are absolutely dominant, and Lovington used to be able to scrap, but they’re pretty young and inexperienced this year, so I think we can overpower them.